So far this month we’ve been warmer than normal, which is a continuing trend for almost a year and a half. This weekend’s upcoming heatwave will build upon the already warmer than normal temperatures, and boost the mercury up to about 90°F and possibly beyond. The cause is a combination of a strong dome of high pressure developing over the Western U.S and the excessively long days we’re having due to the summer solstice. We’ll start our steady climb on Friday and by the end of the day we’ll be into the low 80s. Saturday will be the warmest day of the heat spell, and it will be downright hot. 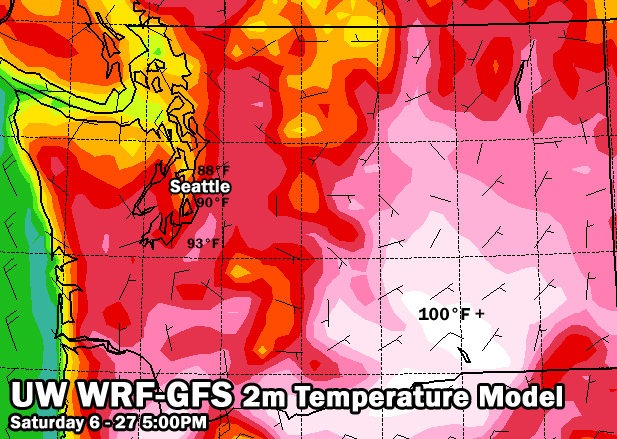 The Puget Sound may see temps in the 90°F range. Sunday may be a dash cooler but the errant 90°F reading is still possible further inland. These temperature forecasts are subject to change within the next 48-72 hours due to the possibility of additional moisture or thunderstorm activity. To understand the complex possibility for thunderstorms this weekend you should first have some context of the basic ingredients that thunderstorms need to develop. Instability: Where buoyant air rises (like a basketball from the bottom of a pool). Moisture: Suspended water vapor that condenses into clouds and rain. Lift: A trigger mechanism which pushes unstable air to finally become a thunderstorm. Lets take a look at each one of these ingredients forecasted by our weather models to evaluate our chances of seeing storms develop this weekend. Firstly, instability. The heat caused by the high pressure and 15 hour long days will cause warm currents of air (updrafts) across the Northwest to climb into the sky. This is the primary cause of the unstable atmosphere. One measurement form of instability is C.A.P.E. (Convective Available Potential Energy). 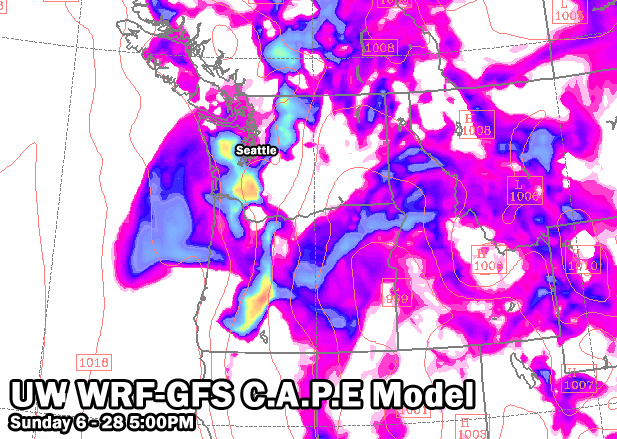 The WRF-GFS model by the UW is showing a large amount of CAPE located mostly over the mountains on Saturday. The instability does migrate towards the Puget Sound by about 11PM. On Sunday the most unstable areas in western Washington will be the southern portions of the region. Instability is mostly harmless unless paired with moisture. Moisture is the fuel that when combined with an unstable updraft can create clouds, and eventually thunderstorms and rain. 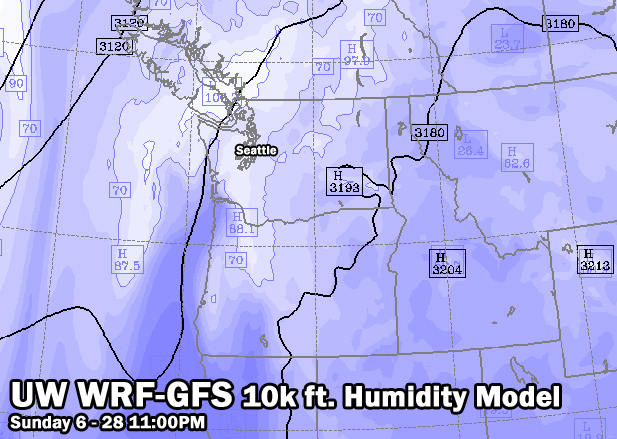 As our huge dome of high pressure develops, a swath of atmospheric water vapor will rotate around it and push directly into the Pacific Northwest as seen at 10,000 ft. on this 700mb humidity model run. The last mechanism needed to spark thunderstorms this weekend is lift. Instability and moisture alone usually aren’t sufficient to create storms. Lift can be generated in many ways, from air being forced up a mountain range, to upper level low pressure systems. 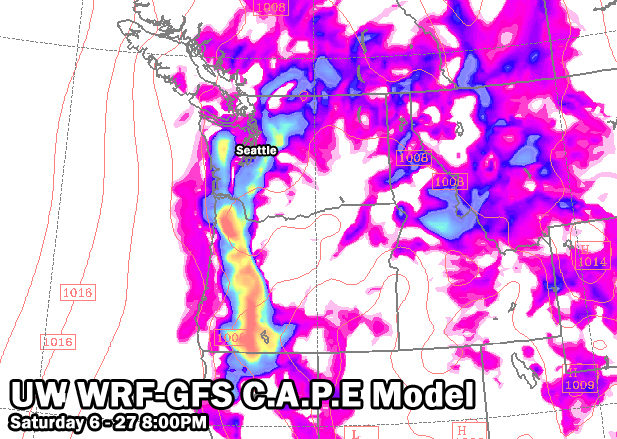 There is a slight inkling that a upper level disturbance might enhance thunderstorm activity this weekend, but the most likely scenario that the only lift available will come from the Cascade and Olympic mountain ranges. If your weekend plans take you into the mountains this weekend, make sure you stay updated and keep an eye on the skies!